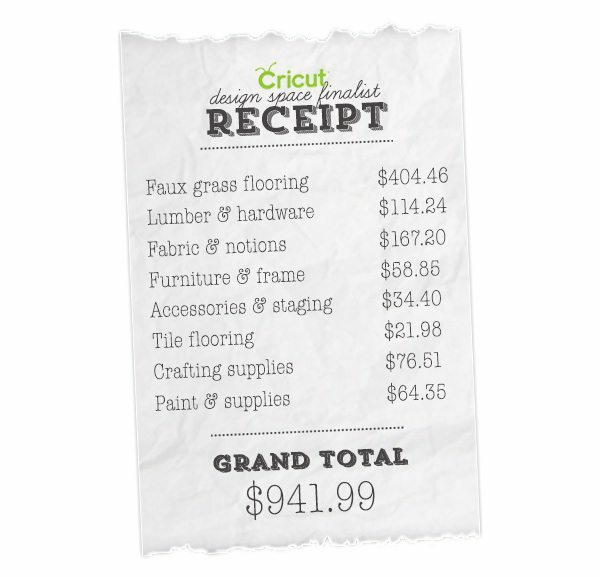 For the last five months, Cricut has hosted the Design Space Challenge. 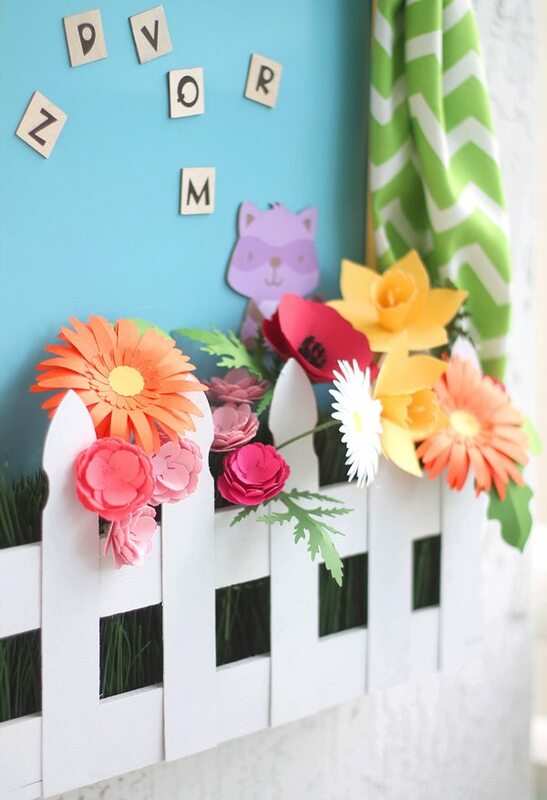 Tons of bloggers created projects with their Cricut Explore and submitted them for voting. After five rounds of competition and hundreds of entries, we are down to five bloggers vying for a $10,0o0 cash prize. That’s some serious shekels, friends. I made it into this final round of competition with my Print Then Cut Cookie Exchange Party…then came the fun part. Exactly two weeks after having a baby, I received an email from Cricut stating that I’d made it into the final round of the Design Space Star competition. I remember it very well. I was sitting on the couch with the baby. My mom was sitting next to me. I read the email and immediately had a huge smile on my face. I looked at my mom and said “I’m in a contest to win $10,000!” My next thought…”How the hell am I gonna do this…all with a baby who’s developed quite the breastmilk habit? !” There was a lot of excitement, worry, fear and confusion at that moment. It was empty, dirty and home to a few random items including an old table top that I used for spray painting small objects. The good news: it was a blank slate. The bad news: it was a blank slate. I could transform this in anyway I wanted, but I had to start from scratch. There was nothing to salvage – nothing to repurpose. Create doable DIY’s that could be accomplished on my newly busy schedule. With lots of support from my mom and husband, I made it happen. First up – a little moving picture action filmed, produced, edited and directed by your’s truly. Watch out Tarantino – I’m coming for you … and I’m pretty sure you have absolutely nothing to worry about. 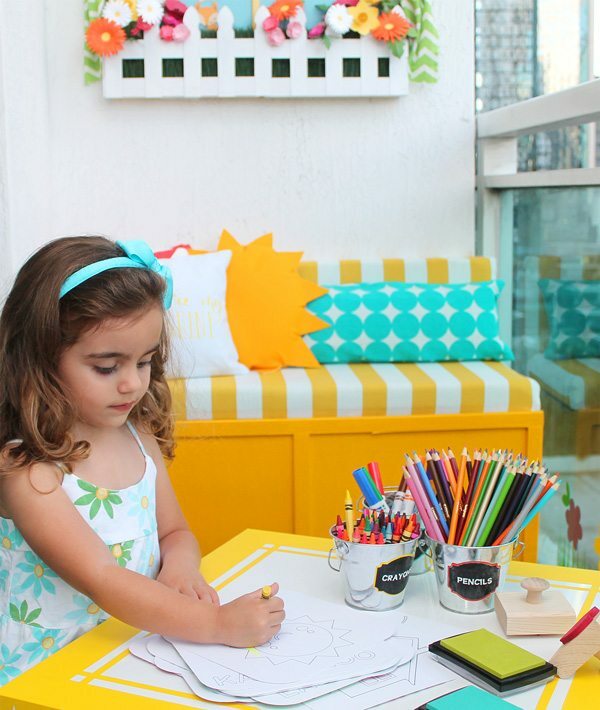 Miami winters are beautiful and offer the perfect excuse for outdoor projects like this. The cool temperature means that you can spend hours outside without sweating your eyeballs out. 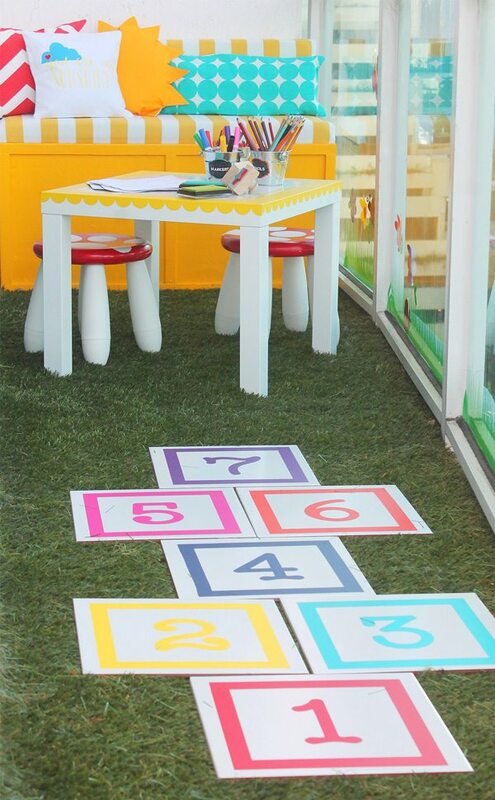 This outdoor playroom is paradise for any kiddo and is a great way to celebrate a comfortable winter and welcome spring. 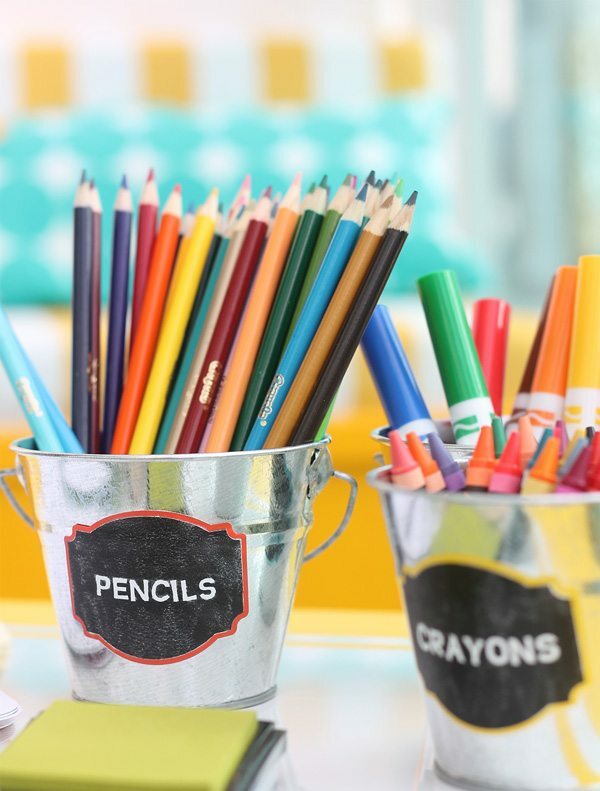 As always, I kept the colors bold and bright and filled this space with tons of projects that will keep any child occupied for hours. 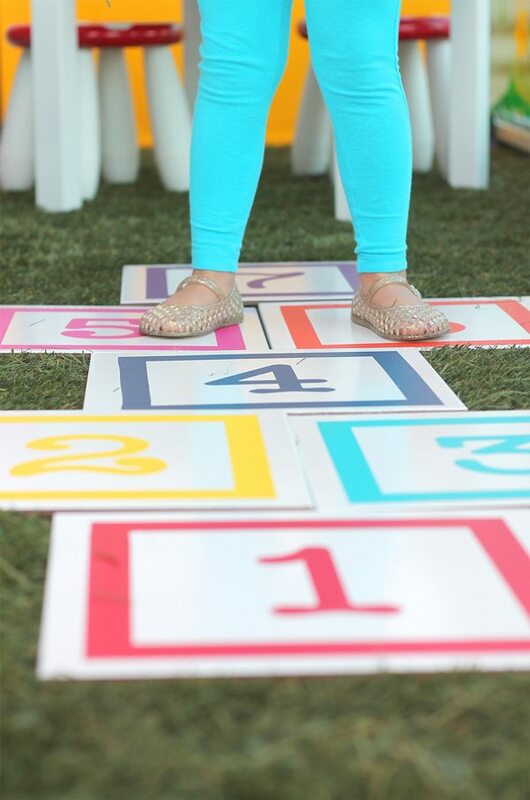 It’s hard to choose a favorite, but this floor tile hopscotch may just be it. This was an 11th hour addition to the playroom and I’m so so happy I squeezed it in. I took 12×12 porcelain floor tiles and added colorful framed numbers to each one. The project took me less than thirty minutes to create, but it has a huge impact! 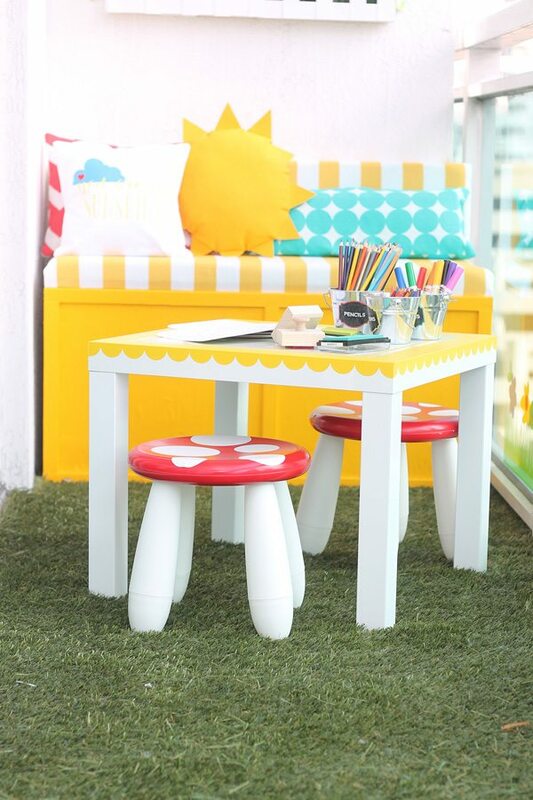 An adorable table and chair set are the anchors of this outdoor playroom – and you will love how easy and affordable they are to create. 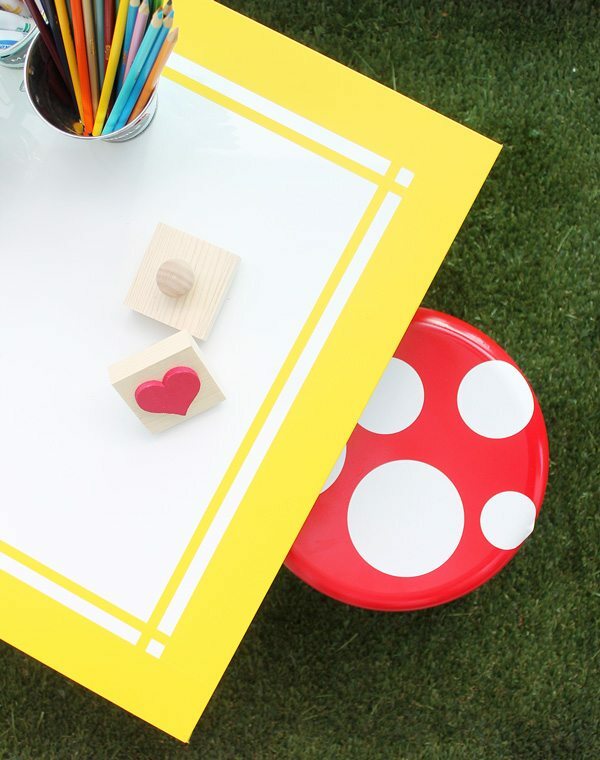 The Lack table and Mammut children’s stools are both incredibly easy to DIY. I spray painted the tops of the stools with my favorite red spray paint then added white vinyl circles cut in various sizes. The result? 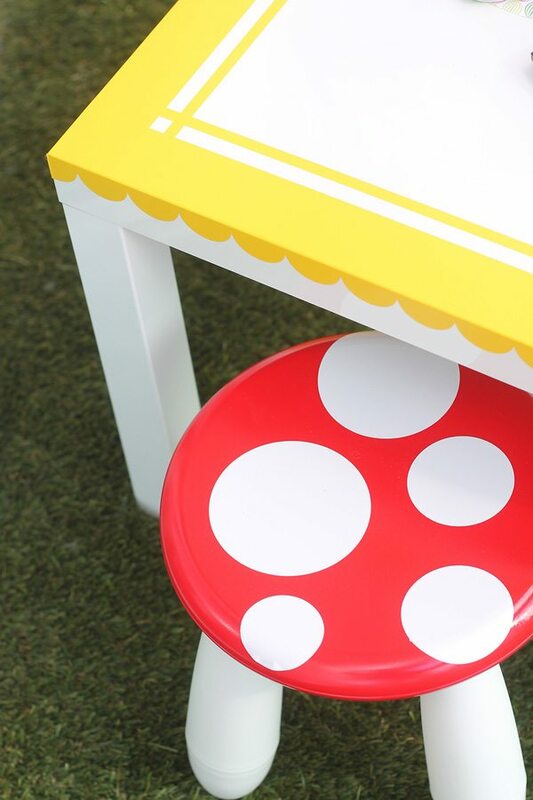 “Toad”stools! Get it? Toadstools. Did you just die? I dressed up the table with scalloped strips of yellow vinyl that I placed around the edges and thin straight strips that I applied to the top for a simple criss-cross pattern. With the table done, I filled it up with supplies that will spark creativity. Every playroom needs something to play with, right? Since the Cricut Explore has a writing function, I decided to put it to work and create a full collection of alphabet coloring cards. I used images from the Design Space Library and created written outlines by selecting the “Write” option on the Layers panel. 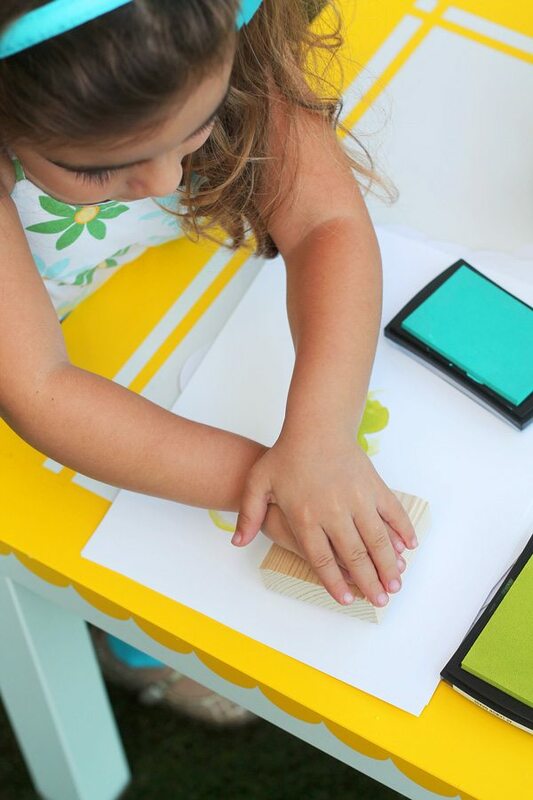 Very easy to do and a great activity for itty bitty hands. Organization is a must so simple galvanized buckets got a quick makeover with labels that I created with three layers of vinyl. Since vinyl will easily stick to itself, I layered chalkboard vinyl onto a slightly larger background and rubbed on some chalk to give it an authentic feel. Last, I adhered white vinyl words to each label for the look of chalk on a chalkboard. The Cricut Explore has a setting for cutting craft foam, so I went to work cutting out a few basic shapes from red foam. Next, I adhered the foam to small wood blocks and added a knob handle. 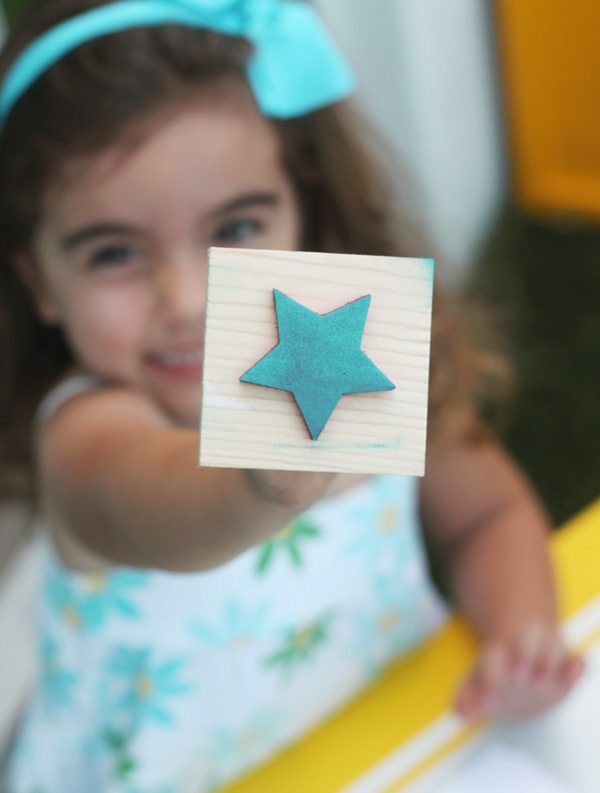 Instant stamps that your kids will love. Now for what is perhaps the most shocking element of this playroom project – I built something! That’s right. I busted out the drill and constructed a storage bench. I wanted to create functional adult-sized seating for this outdoor play area. 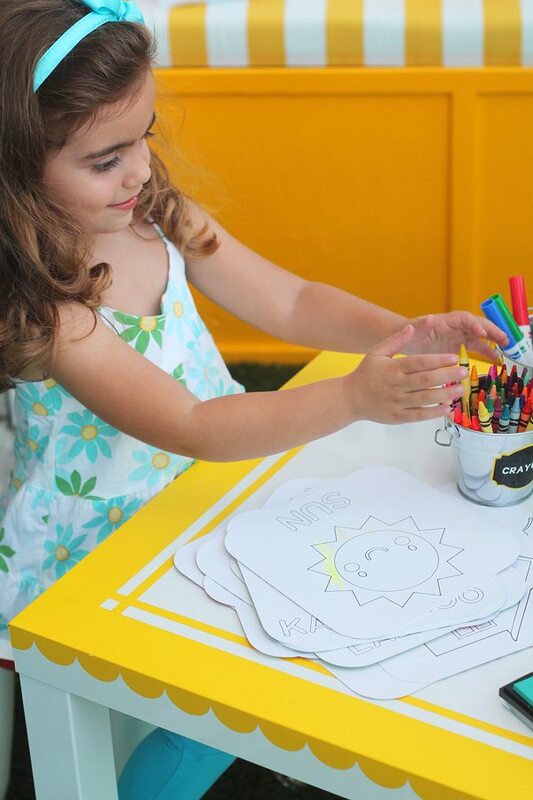 This way, the grown-ups can comfortably supervise while the kids have fun and stay safe…and maybe those adults can grab a coloring page and join in on the creativity! The whole storage bench thing was touch and go there for a while – and for a period of time my bench resembled a coffin. In the end, it worked out and I’m pretty damned impressed with myself. Not gonna lie. I slapped a hefty coat of paint on it and let it shine as a great place to plant your tuchus. I dressed up the bench with fabric covered padding and added some handmade pillows. 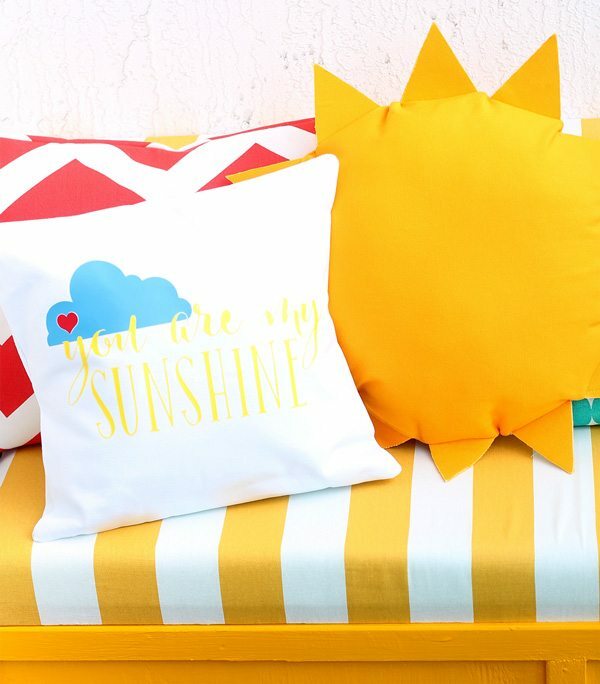 The “You are my sunshine” pillow is nothing more than a few strategically arranged iron-on cuts. To achieve the heart inside the cloud, I simply ironed on the red heart first, then placed the cloud so that it fit perfectly around it. To accompany this saying, it only made sense that I have a sun-shaped pillow which I created with a round pillow form surrounded by triangles cut with the Cricut Explore. 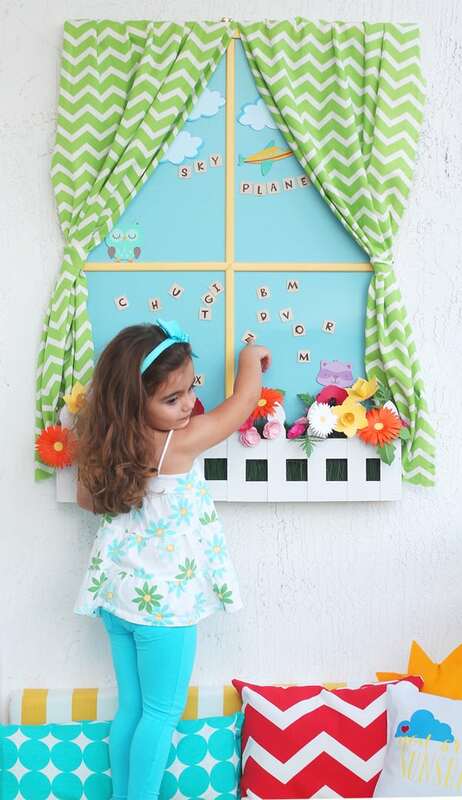 Above the bench hangs a “window” which really drives home the playful outdoor feel of this room…and did I mention that it’s a fully magnetic learning board!? I added a cling garden along the balcony windows as a final touch. 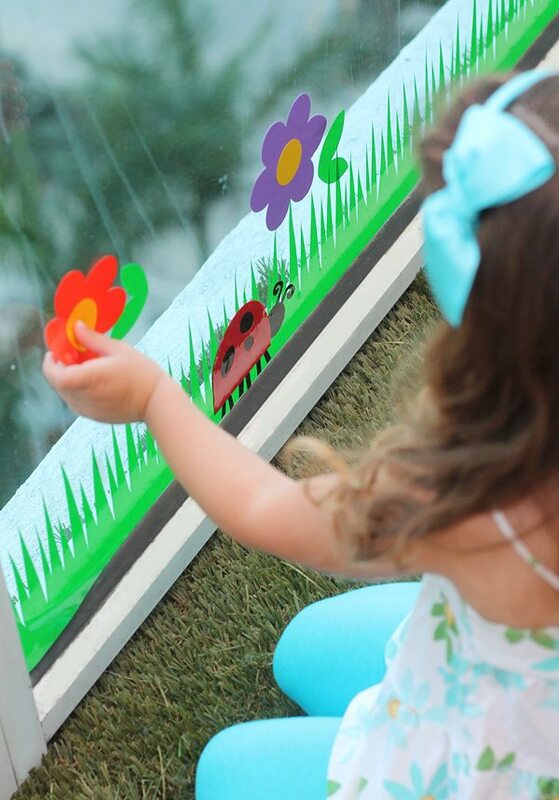 The window cling material is really easy to work with and very forgiving. You can take it off and put it back as many times as you need until you get the perfect placement…and if it loses a bit of it’s “sticky power” just run the cling material under water and let it dry. BTW, how cute is that little lady bug peeking out? So that does it! Are you still with me? Here’s a side by side of this playroom. Wanna come over and play? If you love what you’ve seen, you can head over and VOTE for this project.! Voting is open until Friday, February 7 and you can vote once each day! Click HERE to visit the voting page and be sure to cast your vote for Damask Love. 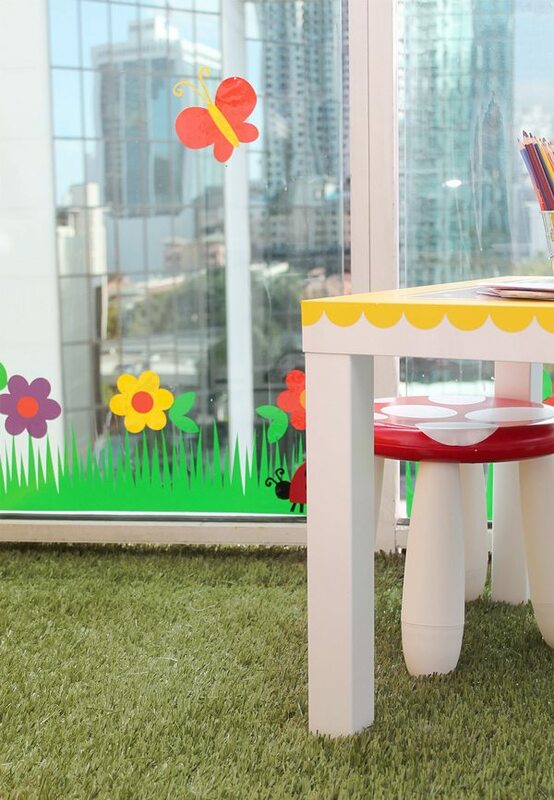 The faux grass flooring was, by far, my largest expense which means that you can easily tackle this playroom project on the INSIDE of your home where grass flooring probably isn’t needed. Additionally, if you already own hardware items, paint supplies and extra fabric, you’ll be able to pull this off for a lot less that I did. 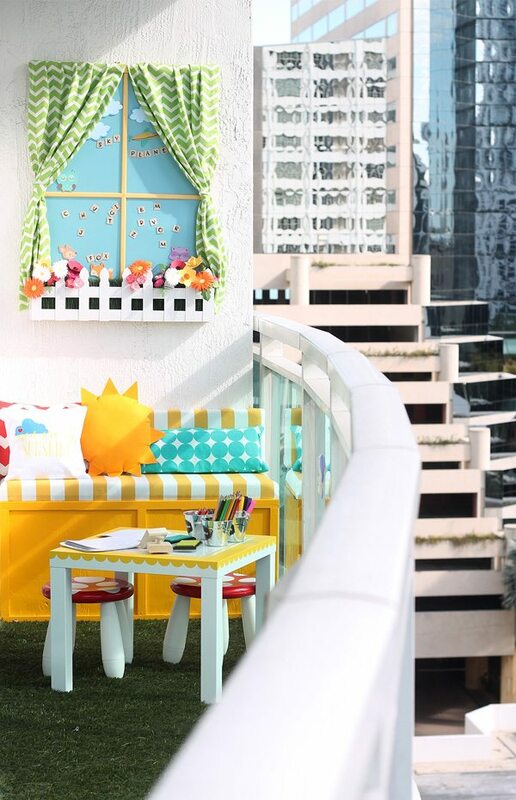 I hope this Playroom in the Sky gives you lots of creative ideas that you can use for an outdoor or indoor playroom You certainly don’t need to make everything you see, but maybe, just maybe, you can bring a bit of the outdoors in with a project or two. Thanks so much for scrolling through this massive post and I hope you’ll send a vote my way! In the meantime, I’d love, love, love to hear your thoughts! Which project is your favorite? thunk! That’s the sound of my jaw dropping! LOVE this space! Those toadstools! That sunshiny pillow! I want to come over and color! Great job! Kid tested and Kid Approved. This is so fun, Amber! Wow, wow and wow!! this is so beautiful and to think you did all this with a 2 weeks baby (all I did at that time, was sleep and eat and feed the baby…) – Wonderful work. Wow……I am at a loss for words. This is absolutely STUNNING!!! 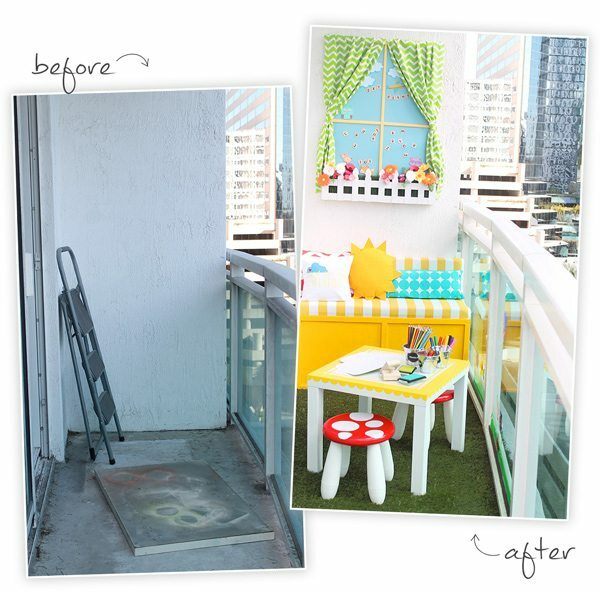 I want to be your kid so I can play in your balcony playroom!!!!!!!!!! Wow, you are truly amazing! Wow! This is amazing! I love the table, the window, and the window cling. You are seriously the most creative person on earth! Love this project!!! Your son will enjoy too, once he’s older, so AWESOME!!!!! Your creativity never ceases to amaze me! Seriously, this has to got be the cutest thing I have ever seen. I’m pretty I was just sitting in the corner of the couch nursing my son for the first few months of his life playing on Pinterest. I definitely was not dreaming up lovely spaces like this. Great JOB! Congratulations so far, Amber! Your ideas are brilliant. This is over the top amazing. Cricut would be nuts not to choose you!!! I love this idea and the space you created. Quick question: Are you worried about children being able to climb up over the balcony edge from the bench or table/chairs? I got really nervous when I saw that. I came to the contest page to vote for my friend, but now I want to vote for yours! Super cute! Great question and your concern definitely didn’t escape me when I put together the design of this “room.” I built the bench so that adults would have somewhere to sit while the kids play. You definitely want some adult supervision for this playroom. 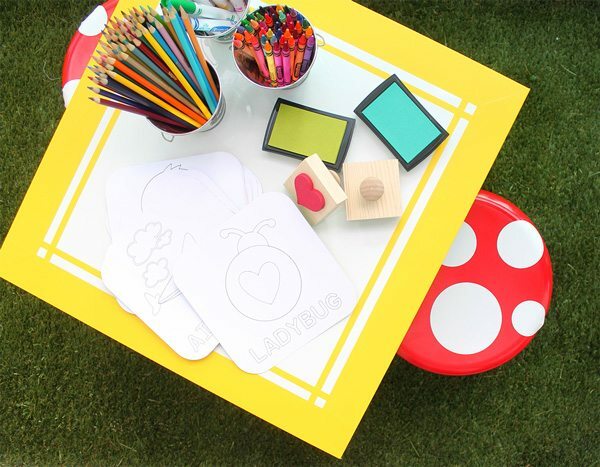 If you’d prefer to create something where adult supervision is less necessary, you can use any of these ideas on an indoor playroom and I’m sure it would be just as cute! I truly hope you win! Your project is fabulous! I’m voting for you. 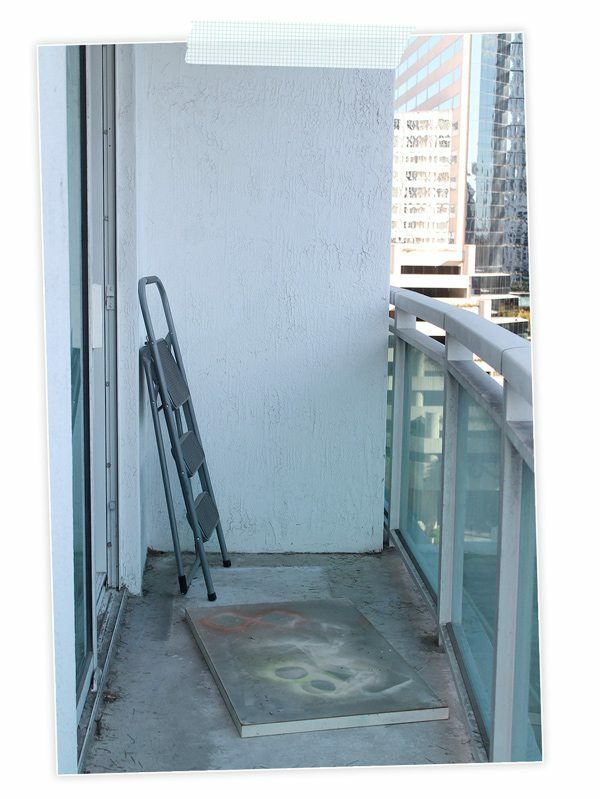 Amber – what you did with this balcony is totally awesome. You completely transformed it in every way possible. 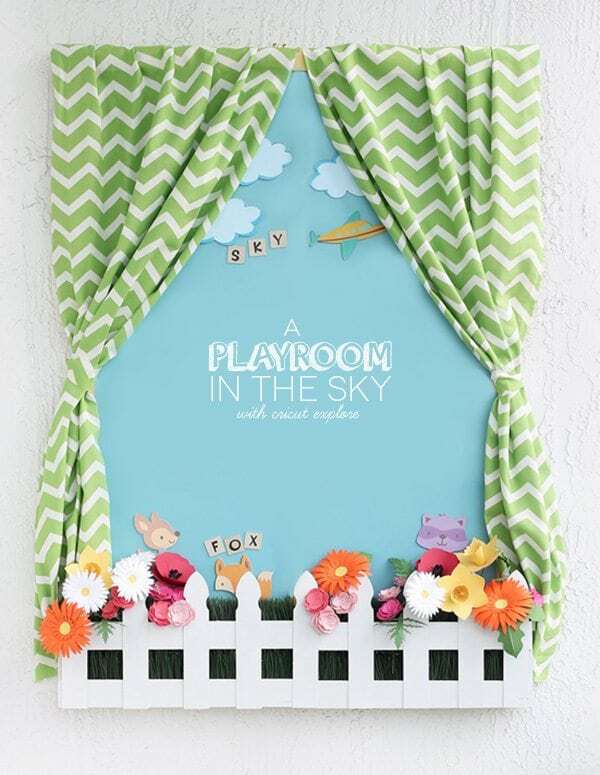 What little girl or boy wouldn’t want this playroom in the sky. I just checked out all projects and this is truly amazing- such a beautiful, creative job well done!! (and with a new baby!?) Good luck to you and you have my vote!! This is adorable and my favorite! I already voted on you! But I have to ask you something: aren’t you afraid of your daughter climbing on that bench or at the table and falling off the balcony? Please, please, pleaaaaase, instal a safety net. Sorry, I don’t mean to scare you, but I though I should alert you. I panicked when I saw that picture, after the video. Thanks so much for your comment, Chris and thank you especially for your vote! 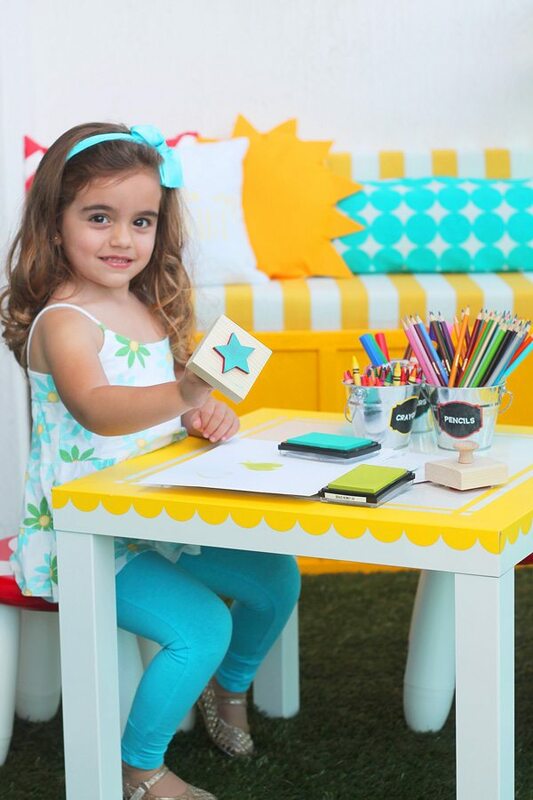 Not to worry – we had all eyes and hands on my friend’s daughter as she posed for these photos! 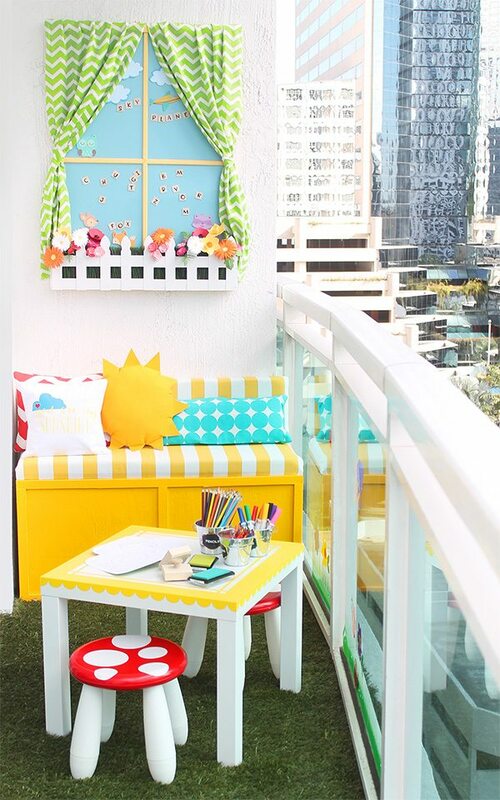 This balcony playroom is definitely something that absolutely requires adult supervision and you’ll be happy to know that we’ve already looked into installing a safety gate above the railing so that it will be ready once the baby is older and more mobile. Thanks again! Have a good one. Wow! I’m blown away. This is so incredibly cute. And so much detail. Congratulations! Beautiful. Glad to see that you won! What creativity! Such an amazing space! Your space deserved to win because it truly was the most dramatic transformation and there was such a variety of Cricut projects. Just awesome!! Congrats! It was this post that sparked my interest in Cricut. After some research and looking around I’m proud to say I just got my new Cricut Explore. I can’t wait to use it with my next project. I just saw this. I found you through the Cricut Everywhere contest on Facebook. Anyway, this is beautiful and amazing. How you got this done with a newborn is a feat all by itself. Anyway, congratulations. I hope you won. I live in Miami and if you give classes, email me!